An 11-year-old Indiana boy has been charged with shooting his state trooper dad because he was upset that his parents had confiscated his video games. Court records state that the **** shot his father - Indiana State Police officer Matt Makowski - in the buttocks on February 22. The boy used his father's .45-caliber duty weapon in the incident, having previously retrieved the gun from Makowski's locked police car. The car was parked outside the family's Granger home, the South Bend Tribune reports. The police officer told authorities that he locked the weapon inside the vehicle, in hopes of keeping it away from his children. Police responded to reports of a shooting at the family's home at approximately 11pm, where the boy surrendered to authorities without incident. 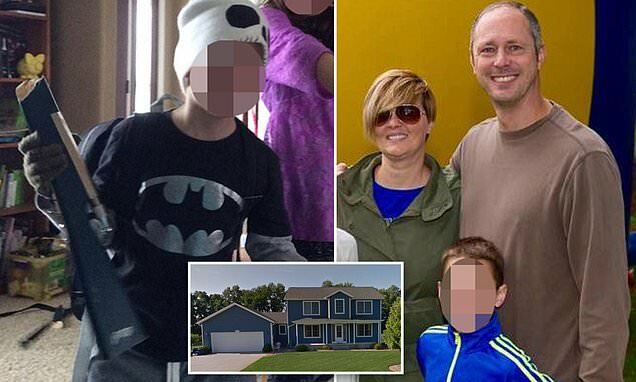 They found the boy's parents in the master bedroom. Makowski was rushed to a local hospital and is said to be 'steadily improving'. Allison Makowski, the boy's mother, told police that they were sleep when she heard a loud 'gong' before her husband started screaming in pain. She went looking for her son and found the service weapon outside the couple's room, on the floor.